KNAC.COM - Reviews - METAL CHURCH Live In Pittsburgh, PA With Photos! 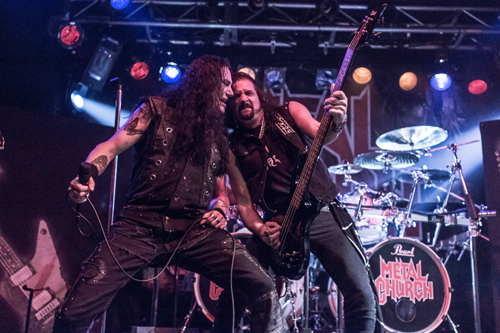 METAL CHURCH Live In Pittsburgh, PA With Photos! On the strength of their self-titled 1984 debut, METAL CHURCH was credited with having a strong influence on the emerging thrash scene. At the time, they were playing a cutting edge style that combined elements of thrash, speed and power metal - all before these genres were nearly as well-defined and categorized as they are today. Their fundamental appeal, however, has always been their ability to balance aggression with melody - documented in a strong catalog of headbangable and memorable songs that intelligently address social issues and topics. 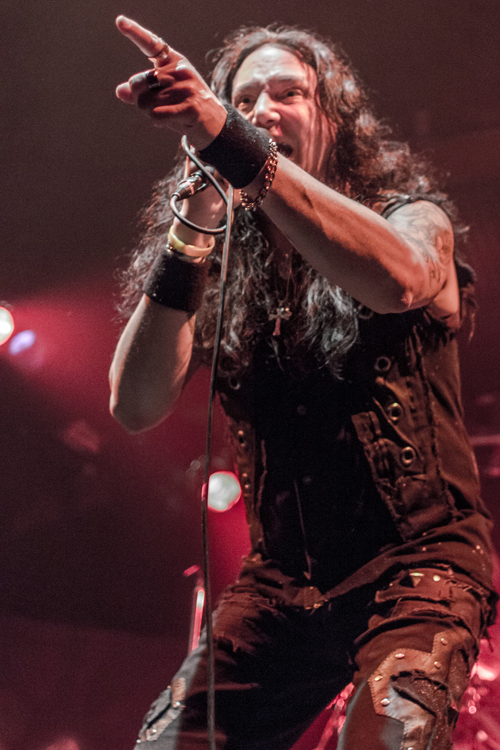 These virtues were on full display as METAL CHURCH took the stage at midnight in front of an energetic and near-capacity crowd of believers at the Rex Theater in Pittsburgh's Southside. Considering that their last appearance in the Steel City was 1991, the strong turnout was still a bit of a surprise. Put it down as a testimony to the band's impact on - and continued relevance to - the metal faithful. Not to mention the fact that major label artists from metal's heyday gained a lot of traction in the marketplace that continues to serve them well. METAL CHURCH chose the Rex to shoot footage for an upcoming video, so they opened by playing "Ton of Bricks" and "Start the Fire" twice back-to-back (with the first run-through of "Ton of Bricks" marred by technical problems with guitarist Rick Van Zandt's gear). It felt a little strange, but the fans were told beforehand, so it gave them a chance to show Pittsburgh's "mettle" (pardon the pun) to the world. The remainder of the set continued to focus on their classic albums (Metal Church, The Dark, Blessing in Disquise and The Human Factor), only touching on the four discs they have released in the new millenium (one song from A Light in the Dark and two from their latest, 2013's Generation Nothing). Guitarist/composer/mastermind Kurdt Vanderhoof is the sole original member, but vocalist Ronny Munroe has helped him to anchor this incarnation of the band since 2004. Kurdt stated when introducing Ronny, "This is the man that makes all of this possible." Even the best songs will fall flat without a vocalist that can deliver them properly, so Ronnny does deserve a lot of credit. He has established his own reputation on four METAL CHURCH releases, but still sings their earlier material with confidence and conviction. The rest of the band also turned in a rocking performance; drummer Jeff Plate (also of TRANS SIBERIAN ORCHESTRA); bassist Steve Unger (also with the band since 2004); and lead guitarist Rick Van Zandt are all pros and did an excellent job both individually and collectively. The sound production and mix were good, although I think they could have been better if the overall volume was dialed back to allow for a better balance. Vocals could have been bit more upfront as well. Despite these small issues, the crowd didn't seem to notice or care; for 20 bucks to see a band of this caliber, it's hard to complain too much. In summary, a fine evening of music, with METAL CHURCH preaching to the faithful - and proving with the strength of their performance and material that they are indeed a classic American metal band.